On the magical night Saturday, November 14th, 2015, Sami and Lucas celebrated their wedding at the luxurious Paradise Banquet Hall—an astounding venue recognized for its elegance and professionalism. 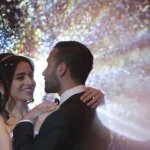 In addition to the celebration, we here at SDEWeddings, Toronto’s premier wedding videography, cinematography and photo booth company offered an equally gratifying experience with our state of the art service. With our modern white vintage backdrop, treasure chest full of props, and unlimited amount of prints, our photo booth proved to be a fantastic inclusion for all guests to enjoy. Scroll down below to see some of our favourite moments of Sami and Lucas’s special day.